I moved in a locality where all the homes around were supplied with hard water. This was a frustrating time for me because I wasn’t used to using hard water in my previous apartment. Everybody in the neighborhood has a water softener installed, so who was I to be left behind? The big problem was now getting the best unit since I had no knowledge about the best water softeners on the market. After seeking help from different users and researching online, I found a recommendable water softener that everybody was talking about. I had no option but install it in my house so that I would continue enjoying the benefits of soft water. The Fleck 5600SXT is a great savior, and ever since I installed it, I no longer worry about rough skin and hair. I also use less soap and shampoo and my clothes are also soft. All I can say, having this water softener will greatly help in reducing your monthly expenses, damaged appliances, and energy costs. I made this review to provide you with more details about the product so that it will be easy to make the right decision. Having hard water in your home is the worst. You end up using a lot of soap cleaning or bathing. Moreover, the water deposits on your plumbing system and water appliances corrode hence compromising their performance. 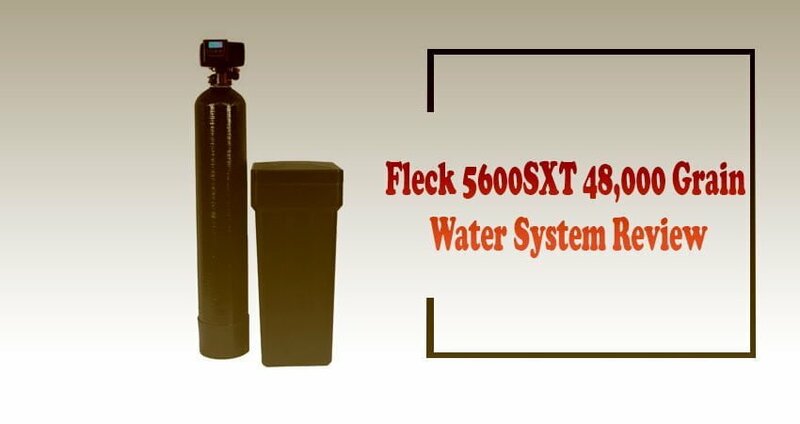 With the Fleck 5600 water softener, you will enjoy the soft water at your home. This unit works well through the use of ion exchange system that removes magnesium and calcium that make the water hard. Before choosing a water softener, ensure that you can operate it with ease. Fleck designed this unit putting the needs of the final customer in mind. It has backlit LCD display, 48-hour internal power backup and touchpad controls for easy operation. For DIY lovers, you will find it pretty simple to install this unit. It can take you up t 2 hours for the whole process to be completed. All you need is some basic plumbing skills, and you are good to go. This is another incredible feature that you will not find in other water softeners. The main purpose of this float is to prevent overfilling. Additionally, there is an overflow drain that provides added safety to prevent messes caused by water in case of spilling. The unit comes with a long-lasting tank with a warranty of 10 years. This is a large tank that can hold up to 250 lbs of salt pellets. It also comes with great warranty on the head which includes the electronics too. Does this water softener have a low salt light? No, the unit doesn’t have a light. Instead, it has a low salt warning voice so you will know when there is less salt. I’m not conversant with plumbing. Will I have a difficult time installing this unit? I’m not a plumber too, but I installed the water softener by myself. It is easy to set up and if you still find it cumbersome, you can seek the help of a plumber. Can this water softener work without a floor drain? I do not think that is the best approach. For the system to work appropriately, you need to use the floor drain for the regeneration process. Bearing in mind the drawbacks that are associated with hard water, you need to look for the best solution to make the water in your home soft. With the many brands of water softeners out there, not all will meet your needs. This is why you should invest your money of a top brand like Fleck that provides the best water softening outcomes. Customers love the Fleck 5600SXT because of its top features and amazing performance in softening hard water. You can also give this model a try and experience the benefits of soft water.